This kit works with all BRS 4 Stage RO/DI Systems along with most other RO/DI systems that use 10" canisters. Products work as advertised, easy to install, and nice of BRS to package them together! 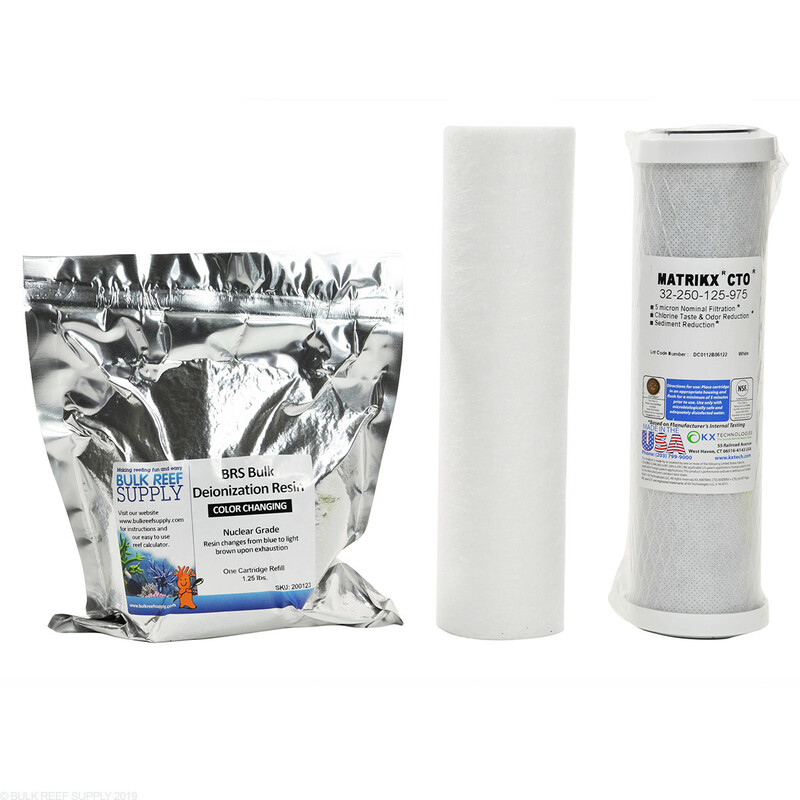 Easy replacement filter and resin! It's a "no brainer"! Up and running in 20 minutes. I really am pleased with the filters and resin that I have purchased fro BRS. The price is spot on and shipping is dependable. I always buy an extra to keep one on hand. Plug and play! Super easy to replace the filters in my ro/di unit...no other way to buy filters! Bought one of these several months ago, finally starting to show signs of needing replacement. I do weekly water changes, and am just now starting to see tds. Long lasting filters and DI resin! Very easy to do with no guess work. Do you have our 4 stage RO/DI filter system? If so, the last stage to the right is the DI stage. When you remove that canister the bottom will screw off the cartridge inside of it allowing you to replace the resin. Will these cartridges work to replace filters on a Coralife Pure-flo II 50 gpd system? 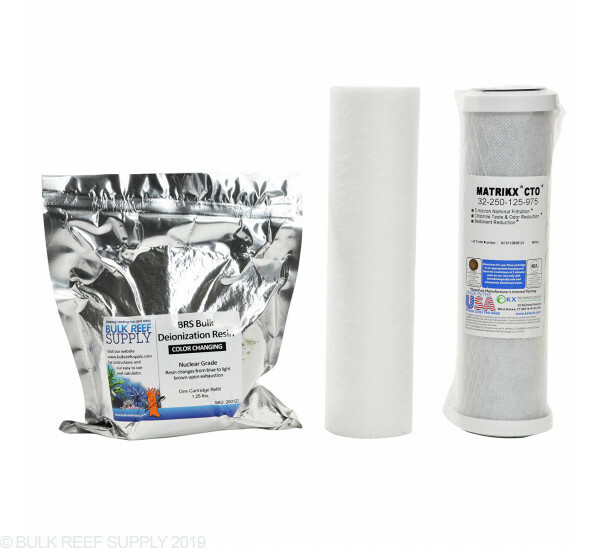 Our filters are universal 10" filter sizes that will fit almost any unit on the market (including the Coralife). Keep in mind that we package our DI resin in vacuum sealed bags to be used with refillable cartridges. If your DI cartridge isn't refillable youll want to pick up a refillable one the first time as well (sku 200002). I upgraded my 75 GPD RO/DI unit to 150GPD. I recently purchased replacement filters due to seeing green algae inside the filters and housings. I changed out and rinsed out as much as I could when changing filters and DI resin. However, I am seeing more algae starting to show again. I took ALL filters out and ran some clorox water thru the system, then flushed it with clean clear water. My system is located under a deck outside my laundry room. It gets no direct sun. What can I do to stop the algae? Should I drain the filter canisters when not using it? I ran clorox thru since I figured the 1/4 tubing maybe have algae contamination. Even though your system may not be getting direct sun it is still receiving enough light to support algae. I would place it in a cabinet or cover the canisters to completely shield it from the sun. This should be enough to prevent algae growth. Running bleach through the system should kill any algae spores but it will also damage your RO membranes and quickly exhaust your carbon filters which are now likely contaminated with algae. Its also possible that your tap water contains enough algae to contaminate your system so this could be a never ending battle in your current situation. Before running any more bleach through the system I would try the first solution and go from there.